observe the help if needed. Broken Arrow Soccer Club is excited to invite you to a FREE Soccer Clinic for all BASC players. 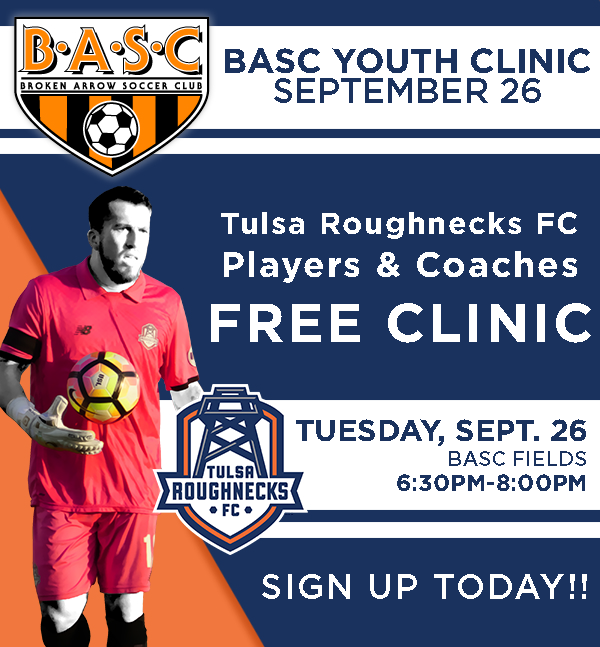 Tulsa Roughnecks Players and Coaches will be leading a clinic for BASC players. They will be running a variety of drills to help develop your player on the field as well as drills for goal keepers. The clinic will be held at Indian Springs Soccer Complex on September 26, 2017 from 6:30-8:00pm. It is open to players ages 7 and up. The concession stand will be open during the event so you can grab something to eat while you are at the complex. The Roughnecks players will also be signing autographs. Bring something for them to sign.